Send a�gift to lift their spirits! Rx To Say Get Well Care Package. A care package to help send the message that you are thinking of them and hoping for a quick recovery. 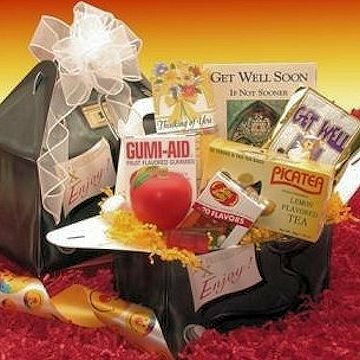 This gift includes the following: RX Prescription Gift Box contains Gummi Aid Gummi Band Aides, Thinking of you Lemon Shortbread cookies, lemon tea, Jelly Belly asst jelly beans, Get Well Soon if Not Sooner Book which has over 100 pages of inspirational stories of triumph, Get Well Popcorn, and a Relaxable Stress Ball (assorted colors/styles).